Although India has given the world a large number of important food and other crop plants, only four vegetables are among them. One of these is the cucumber (Cucumis sativus). The others are eggplant, Indian mustard, and cowpeas. The English word "cucumber" comes from the Latin name cucumis. The Bohemian agyrka, German Gurke, Greek aggouria, and our word "gherkin," meaning a small cucumber pickle, all trace back to an old Aryan word. Sometimes today we facetiously refer to this vegetable as "cowcumber," not realizing that English writers of 300 years ago called it "cowcumber" in all seriousness. 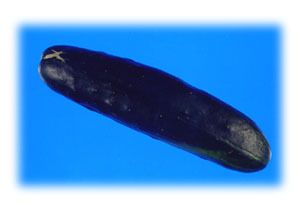 The cucumber is believed native to the great Indian center of plant origins which lies between the northern part of the Bay of Bengal and the towering Himalayas. It has never been found wild anywhere, but species closely related to it have been found wild in that region of India. That the cucumber was carried westward from India long before written history is indicated by the profusion of ancient names for it in widely separated lands to the west: Aryan, Greek, Latin, Arabic, Armenian, and others. Contrary to often written claims, there is no proof that the ancient Egyptians grew it. One old record claims that the cucumber was introduced into China as "recently" as the second century B.C. At the beginning of the Christian Era it was grown in North Africa as well as in Italy, Greece, Asia Minor, and the countries to the east. The Romans used highly artificial methods of growing the cucumber when necessary to have it for the Emperor Tiberius out of season. He is reported to have eaten cucumbers every day in the year. Charlemagne had cucumbers grown in his gardens in 9th-century France. They were known in England in the early 1300's, but the art of growing them was apparently lost there as a result of a long period of war and turmoil. Cucumbers were reintroduced into England from the Continent some 250 years later. Columbus brought the cucumber to the New World, along with many other vegetables. He had them planted in Haiti in 1494, and possibly on other islands. Reports of finding the Indians in Canada growing cucumbers in 1535 seem hardly probable so soon after Columbus, introduced them into the West Indies. Some form of native squash or gourd could have been mistaken for cucumber. Reports that in 1539 De Soto found the Indians of Florida growing cucumbers "better than those of Spain" are more credible. Explorers who touched Virginia in 1584 mentioned cucumbers. Presumably they had been spread by Indians after introduction by Spaniards far to the south. They were grown in the first permanent English settlements, in Virginia in 1609 and in Massachusetts in 1629. Before the American Revolution the eastern tribes of Indians as well as the colonists were growing cucumbers generally. They were grown in Brazil before 1650. Most of the distinct types of cucumber grown today were known at least 400 years ago. Present forms range from thick, stubby little fruits, three to four inches long, up to the great English greenhouse varieties that often reach a length of nearly two feet. The most popular European and American varieties now have smooth, dark-green skin. Some Russian varieties are short, thick, and have a rough, netted brown skin. Large white varieties of a thick, irregular shape were grown in France in the 19th century for use in cosmetics. That form is supposed to have reached northern Europe from Spain. One of the most interesting things about the enormous English "forcing" (greenhouse) type of cucumber is that, as marketed, it is almost completely seedless. Its fruits will develop without any pollination of the pistillate flowers, and therefore without forming seeds. How, then, does the grower obtain seeds for growing this seedless cucumber? He has only to pollinate the flowers by hand, or put bees into the greenhouse to do the job for him. Varieties commonly grown in America do not have this ability to form fruits without pollination. The so-called "gherkins" that we buy pickled in bottles or glass jars are simply pickled small cucumbers. The true gherkin, or West Indian gherkin, is a different species (C. anguria) that is rarely grown in the United States. It produces a warty (or "prickly") oval fruit about an inch long.